CARSON, Calif., April 26, 2018 /PRNewswire/ — U.S. Auto Parts Network, Inc. (NASDAQ: PRTS), one of the largest online providers of aftermarket automotive parts and accessories, today announced that JC Whitney, U.S. Auto Parts’ subsidiary that has offered DIY-minded enthusiasts “Everything Automotive” for over 100 years, is accepting entries for a new and very special sweepstakes to honor the many everyday American heroes who keep America safe and free. The “Pay it Forward” Sweepstakes is open to those who are either active duty or a veteran of any U.S. military branch; a current or retired federal, state, or local law enforcement agent; a firefighter, or an emergency responder from the public sector. The grand prize is a fully customized 2017 Ram 1500 Crew Cab 4X4. 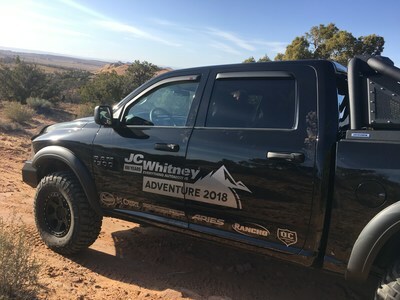 The JC Whitney Adventure 2018 Truck takes “Pay it Forward” on the road to truck and jeep events across the country, helping to spread awareness about the many unsung heroes who keep us safe, while offering thousands of auto enthusiasts a peek at their dream customized truck. The road trip culminates in Las Vegas where the sweepstakes winner will be announced and the truck will be awarded. In addition, as part of the “Pay it Forward” initiative, JC Whitney is asking (although not requiring) that entrants send a picture in uniform to JC Whitney’s American Heroes Gallery (http://bit.ly/2Hvl5A8) where they can share their special stories. Sweepstakes entries can be submitted at http://blog.jcwhitney.com/jc-whitney-pay-it-forward-sweepstakes-2018/.